Causes of stiffness and difficulty in moving your shoulder. There are many problems that can occur in the shoulder that can make it difficult or too painful when trying to lift or move your arm. More often than not this is due to an issue with the rotator cuff (see list below). The rotator cuff is the most common cause of pain in the adult shoulder. Rotator cuff pain is the number one reason why you have pain on the outside or top of your arm. It is also the main reason why you may not be able to lift or have pain when you move your arm. Shoulder pain could also be brought on by injury. Believe it or not, traumatic injuries are a less frequent cause shoulder pain. Rotator cuff injuries can be caused by chronic repetitive stress from working out, throwing or overhead sports. Rotator cuff injuries can also be caused by a fall, or perhaps even a long day gardening or painting your house. The rotator cuff are a series of four muscles that are deep to or underneath your deltoid muscle. Together those four muscles control your shoulder motion and are critically important to the proper functioning of the shoulder. The cause of your shoulder pain and the reason why it hurts will vary by age. Some problems are more common in different age groups. In younger athletes tendonitis is more common. In middle age, rotator cuff tendinosis, calcific tendinitis, AC Joint arthritis and a frozen shoulder are more common causes of pain. Let’s run through the most common reasons why you have pain on the top or side of your shoulder and why you have pain when trying to lift your arm. In people over 30 rotator cuff tendonitis is very rare and rotator cuff tendinosis starts to become the most common cause shoulder pain which hurts when we try to lift our arm or shoulder. Rotator cuff tendinosis, by definition implies some degree of rotator cuff degeneration. With that degeneration comes an increase in the numbers of nerves and blood vessels. That is the body’s response to the degeneration, and that is why the pain occurs. Too many nerves in the area produces pain with certain motions. If the pain is severe enough you will be unable to raise your arm or unable to sleep on that side. When patients have rotator cuff tendinosis, physical therapy is generally effective at managing the pain. 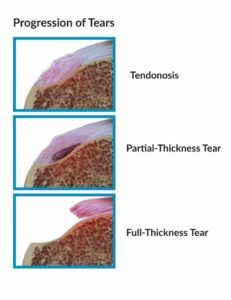 If the pain persists despite therapy, we now have a biological patch which may be able to reverse tendinosis and alleviate your shoulder pain. Many people who cannot lift their arm due to shoulder pain from rotator cuff tendinosis will be told that they have impingement syndrome and a bone spur. This video post discusses our current thoughts on bone spurs and shoulder pain. 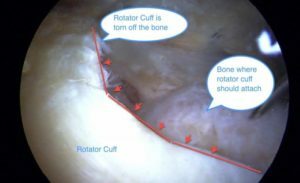 Rotator Cuff Tendinosis – is a cure possible? As the rotator cuff continues to age or degenerate a portion of the rotator cuff might separate from the bone that it is normally attached to. This is usually part of the natural progression of tendinosis. If enough of the rotator cuff starts to separate then we have a small cleft or defect in the rotator cuff attachment. We call that a partial tear. Partial tears are not large enough to cause weakness of the shoulder. However, if you have a painful partial tear, you can have pain on top or on the side of the shoulder. In addition, you may find it very painful when trying to lift the arm overhead. Some partial tears hurt, while others do not. Determining if your partial tear is painful is usually possible with a physical exam. Most people with partial tears of the rotator cuff are going to respond to physical therapy. If physical therapy and other non-surgical treatments do not improve your pain, then surgery to place a unique biological patch has a very high likelihood of alleviating your night pain and pain with lifting your arm. See this post for more information about the patch and how it works. Some of you are reading this because you fell on your shoulder and now you can not move your arm. In acute traumatic situations like this, there is a chance that you ripped the rotator cuff off from the bone. If you fell, and now have significant weakness in your arm you should see an Orthopedic Surgeon soon. This post covers what to look for if you think you had a serious shoulder injury. The rotator cuff controls how well the shoulder functions. 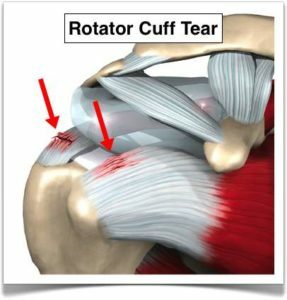 If your injury caused a rotator cuff tear, your complaints and symptoms may be related to the size of the rotator cuff tear. If enough of the rotator cuff has torn then it might be impossible to move your arm due to severe weakness. Many people with acute, large, traumatic rotator cuff tears will require surgery in order to restore function. In general, the treatment of rotator cuff tears depends on the cause of the rotator cuff tear and I go into more detail in these posts here and here. 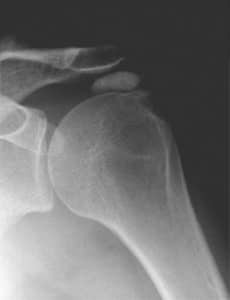 Calcific tendonitis of the rotator cuff can be a VERY painful entity. You are usually very easy to diagnose in the office since the pain can at times be very significant. In this situation, calcium crystals deposit inside the tendon itself. That leads to a significant increase in the number of nerves in that area, and that causes severe pain. Luckily, a non-surgical approach with an ultrasound guided injection to wash the calcium out of the rotator cuff results in pain relief in the majority of cases. Surgery is very rarely necessary for calcific tendonitis. For more in-depth information on calcific tendonitis please see these two articles here and here. Adhesive capsulitis or a frozen shoulder is a very common cause pain and of loss of motion of the shoulder. A frozen shoulder causes pain all around the shoulder. The pain can be on the top of the shoulder, or the pain can be underneath the shoulder in the axilla. In this situation, the ligaments and capsule around the shoulder become very thick, very tight and very inflamed. The diagnosis is straight-forward… since the definition of a frozen shoulder is loss of motion compared to the other shoulder. The treatment of a frozen shoulder is generally physical therapy. A shoulder pulley system can help you perform stretching on your own. On occasion we might recommend an injection directly into the shoulder to diminish the inflammation. For people who do not improve with physical therapy will can consider an arthroscopy, which is a surgery performed with small holes and cameras. During that surgery we can remove or lengthen the tight inflamed tissue which is stopping the shoulder from moving. In people under 30 years of age, including youngsters, the most common cause of shoulder pain is because of rotator cuff tendonitis. This simply means that the rotator cuff is inflamed from performing too much activity. Often times rotator cuff tendonitis can be considered a training error at any age. A training error occurs if you add on a new activity or perform too many sets. A training error occurs if you jump in the pool and swim a mile after not swimming for a few weeks or months. In most cases of rotator cuff tendonitis due to over-training or improper training the pain is going to go away within a few weeks as the shoulder gets used to your new routine. In childhood (under 16), and particularly in overhead athletes, a stress fracture of the humerus is a possible cause of shoulder pain. These stress fractures actually involve the growth plates of a growing child. These fractures need to be identified early as rest results in healing. If these fractures are not identified early a young athlete could have lifelong shoulder issues. Usually just an x-ray will suffice to diagnose these growth plate stress fractures. In children and teenagers rotator cuff tendonitis is usually associated with overhead sports and weight lifting. In teenagers, rotator cuff tendonitis can be caused by instability issues where the shoulder is trying to slide out of place. Instability will occur if the ligaments have become loose over time because of pitching, swimming, etc. This is a more subtle form a instability than a youngster who was tackled or hit and dislocated their shoulder. 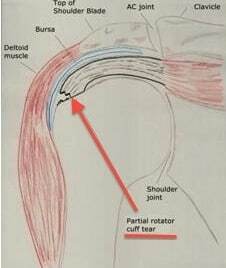 Rotator cuff tendonitis due to instability is most commonly seen in children who are throwers, volleyball players and swimmers. By addressing the underlying instability issue with physical therapy both the instability and the secondary rotator cuff tendonitis will resolve. On occasion, surgery to address the instability can tighten the ligaments and this will also resolve the rotator cuff issue. For many painful shoulders a compression/ice sleeve can ease the pain. (We can not guarantee the effectiveness of the sleeves/ice wraps. Some people find them helpful while some do not). The AC Joint is a small joint on top of your shoulder. It is where your collar bone meets the shoulder blade. Many people notice a small bump above their shoulder. That is the AC joint. Over time that joint can suffer from arthritis. Arthritis of the AC joint is the number one cause of pain on top of the shoulder. If the pain from the AC joint is severe enough is will cause pain when trying to lift your arm or move your shoulder. Ice, heat, anti-inflammatory medications can all help ease the pain from an arthritic AC joint. Injections can be useful too. For people who do not respond or improve after these treatments surgery might be the right answer. The surgery involves clearing out the AC joint. This article on my site goes into more detail about AC joint arthritis and its treatment. 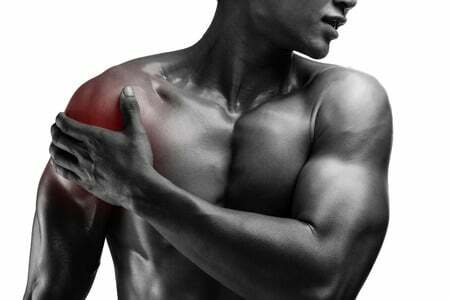 Shoulder pain when lifting the arm is very common. Most of the time it is not due to a single injury. We reviewed many of the most common causes of pain and treatments which are usually effective. Hopefully this has helped you determine why your shoulder hurts and why it’s painful to lift that arm overhead. Very informative. Now I understand my poor rotator cuff. Thanks! Had orthoscopic Sx 6 yrs ago. Lately R (same) shoulder dull pain – this morning hard to raise arm. Hot shower and Ibu 800 helped. Typically, towards evening pain increase Etc. Sad to read great info as I bet it’s my poor rotator cuff. The armpit can hurt in the case of a frozen shoulder. The are other reasons too… see your doc so they can examine that area and check your shoulder range of motion. On early Friday morning I had a nasty fall. I caught the brunt of the fall on the heel of my right hand. It took me several moments to recover to the point where my husband could help me to stand up. I had intense shooting pains from my right thumb all the way up into my shoulder. I have used ice, moist heat, and advil since the fall, and the shooting pains went away, but I still have very limited mobility in my arm (although my fingers and wrist seem to be fine), my right arm is very weak and I am not able to lift it to chest level without supporting it with my left hand, and even then it causes a lot of pain in my upper right arm and shoulder. I have had bursitis in my right shoulder previously (about 20 years ago), but this seems different. Do you have any ideas? i had no injury , but all of a sudden today I have pain when i attempt to move, lift, use my shoulder in almost any direction, position. And if i move it in a certain way it hurts excruciatingly. As I type this, I used my left arm to get my right arm in position. And I can sense where the issue is as I type. In the front, near the surface. It feels like i injured it, but I did nothing memorable. Just started a couple hours ago, and I want to double over when it tweaks. Feels like a tendon is enlarged, and can’t slide over the muscle smoothly, so it seems to catch, and that is when i feel the most sharp pain. I am hoping this is just an brief acute thing. I think I had this happen before, in the recent year or so, but not nearly this painful. And it was short lived. But why? And what do I do? It almost makes me sick to my stomach it hurts so bad when it catches. And it happens with the most innocent of movement, not even a lift, but a slight cross wise move. And not even lifting anything. Just moving my arm. Jill … I’m sorry it hurts so much :-( These are very common complaints from shoulder pain sufferers. The most common causes of pain like you describe include the rotator cuff itself (tendinosis),the subacromial bursa (bursitis) and the biceps tendon (which can become inflamed). Occasionally a very early frozen shoulder will present like this. If the pain persists despite stretching, perhaps Kirsch exercises and Tylenol then I would see a shoulder doc for a diagnosis. Then therapy can be prescribed — which is usually quite successful in the treating the pain of many conditions. My mother of 79 yrs young has been recently told after an ultrasound that she has no tendons left in her shoulder. She had been complaining of her arm being very painful and not being able to raise her arm without the help of her other arm. She has an appt with her doctor next week but what does this mean. Is there anything that can be done? There usually is … but it might be invasive. I hope your visit goes well. It’s likely to be a large rotator cuff tear… but only a good examination and possibly an MRI can tell you for sure. Please see a shoulder doctor soon. My wife developed a situation where it was very painful to move her shoulder. She did nothing noticeable to cause this. She went to the GP and he got her to move her shoulder through the full range of movements, which she was able to do, although with some pain. Less than 24 hours later, she had next to no movement in her shoulder. She went back to the GP, who declared it a “frozen shoulder”, and gave her an injection in the shoulder area. The pain vanished, but she still has no shoulder movement under muscle power. (She can lift it vertically with the other arm)..
Is this more likely to be some sort of rotator cuff problem, rather than a frozen shoulder?…..or are they the same? Yep.. it’s not a frozen shoulder if it can be moved. Can a flu shot in the upper arm cause injury to the arm resulting in the pain (SIRVA)? I had a flu shot and arm pain started shortly after and has been gradually increasing. It has been about 4 to 5 months and now it realllly hurts. A flu shot can result in a frozen shoulder with stiffness and pain. Any injection can. It’s not the medication being injected that causes it. A frozen shoulder can occur with incidental trauma, and most often people do not recall any injury. The “cure” would depend on the diagnosis. Many shoulder conditions can be successfully treated. Sorry Rachel :-( Shoulder pain — pain on the outer part of the upper arm can be terrible. I good examination and an xray are necessary. Without a history of trauma one of the most common reasons is bursitis assoc with rotator cuff tendinosis. Also common in situations which come on suddenly is calcific tendonitis. But only an exam and an xray can tell you and your doctor what’s going on for sure. Good luck ! hi, i dont know what to do. I had no injury, but I can’t move or lift my arm, I have pain in my left shoulder. I can feel everything, but I cant move my fingers, so please help me. I have weak circulation, and I don’t have left a leg, can be there some connection or? I have 65 yeras. I went to hospital but they didnt know what to do, or how to help me, so I started to search the web, and I saw this site, so please if you know the answers it will save my life, because I cant go anywhere, I cant even go to bathroom. Sounds like you need to see an Orthopedic doctor. They can help you determine why this is happening. I do not know… it’s possible. But without an examination by a doctor it’s hard to say. If the pain is that severe he should see his doctor. I recently cannot raise my right arm like if im going to shake hands. Its very weak. my fingers are ok. my hand is functioning ok. No numbness on my arm, no swelling or redness on my shoulder. If I use my other arm to move it around. Its painless. Basically I dont feel any pain for all these. I could only swing it about 30 degrees sideways and doing that, my shoulder will raise too compensating for that action i guess. There is some heaviness when im sitting like driving a car and it will be gone soon. A couple of doctors and physiotherapists were clueless. Ultrasound is the only advise I got. Do you have any idea doctor? Please. Thank you. There are many things that can cause this… without an examination I couldn’t give you a reason.